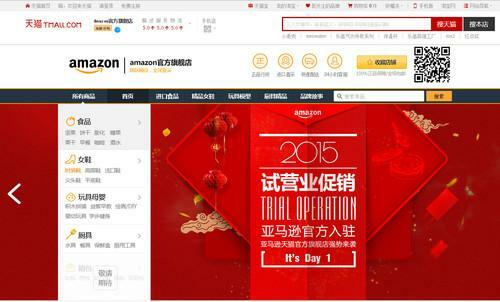 Amazon has started a trial store on Alibaba's Tmall. The new store will officially launch next month on Alibaba's Tmall.com site, and will function as a pilot project, Amazon said Friday. Amazon already has its own e-commerce site geared for the country, but its share of China's online retail market is only 0.8 percent, according to Beijing-based research firm Analysys International. To try and standout, Amazon has been focusing on bringing more imported goods to the country. Last August, it struck a deal to establish a "cross border e-commerce platform" in a Shanghai free trade zone, which Amazon said would bring millions of product selections to Chinese consumers. By tapping Alibaba's Tmall site, Amazon said it wanted to provide Chinese customers with additional access to high-quality international goods. Amazon's store on Tmall, which is already online, offers a variety of products, including wine from the U.S., Lego toys and woman's shoes. About a quarter of the brands offered will be Amazon exclusive, and all products sold will be handled and delivered by the company's China business. China itself is known for manufacturing many of the world's products. But increasingly, local consumers are wary of buying certain goods made in the country, such as baby formula, over food safety and quality concerns. Alibaba said it welcomed Amazon to its ecosystem. The company's Tmall.com is dedicated to selling products from established brands. Samsung, Apple and even Costco Wholesale have opened stores on the site.